Brucellosis is of worldwide economic and public health importance. Heifer vaccination with live attenuated Brucella abortus strain 19 (S19) is the cornerstone of control in low- and middle-income countries. Antibody persistence induced by S19 is directly correlated with the number of colony-forming units (CFU) per dose. There are two vaccination methods: a 'high' dose (5-8 × 1010 CFU) subcutaneously injected or one or two 'low' doses (5 × 109 CFU) through the conjunctival route. This study aimed to evaluate serological reactions to the 'high' dose and possible implications of the serological findings on disease control. This study included 58 female cases, vaccinated at Day 0, and 29 male controls. Serum was drawn repeatedly and tested for Brucella antibodies using the Rose Bengal Test (RBT) and an indirect enzyme-linked immunosorbent assay (iELISA). The cases showed a rapid antibody response with peak RBT positivity (98%) at 2 weeks and iELISA (95%) at 8 weeks, then decreased in an inverse logistic curve to 14% RBT and 32% iELISA positive at 59 weeks and at 4.5 years 57% (4/7 cases) demonstrated a persistent immune response (RBT, iELISA or Brucellin skin test) to Brucella spp. Our study is the first of its kind documenting the persistence of antibodies in an African communal farming setting for over a year to years after 'high' dose S19 vaccination, which can be difficult to differentiate from a response to infection with wild-type B. abortus. A recommendation could be using a 'low' dose or different route of vaccination. Brucellosis caused by Brucella abortus is a widely-distributed zoonosis of importance to public health (Corbel 2006). Animal brucellosis affects mammals, including livestock and wildlife and commonly causes abortion in females and orchitis in males (Chaparro et al. 1990; Dorneles et al. 2015a). In humans, symptoms include fever, malaise, orchitis and a variety of non-specific symptoms (Doganay & Aygen 2003). The KwaZulu-Natal province in South Africa, with a setting similar to the study site, had an estimated prevalence of 0% - 1.5% (Hesterberg et al. 2008). In southern Africa, studies in pastoral production systems have shown the prevalence of brucellosis to be higher with larger herds, extensive movement of animals and co-mingling of herds at common grazing sites (McDermott & Arimi 2002). In South Africa, where heifer vaccination is mandatory, cattle are seen to be the greatest source of outbreaks (Hesterberg et al. 2008). Detection of disease is done using the Rose Bengal Test (RBT) as the serological screening test and the complement fixation test (CFT) as the confirmatory test. Both tests can give false-positive reactions owing to strain 19 (S19) vaccination (World Organisation for Animal Health 2009). Testing is voluntary, except for dairy cattle, where it is compulsory. Testing frequency depends on resources and animal owners' motivation. The government has a Bovine Brucellosis Scheme to encourage animal owners to participate in eradicating brucellosis. Vaccination of heifers together with brucellosis testing and slaughter of positive animals is the foundation for control of brucellosis in cattle in endemic areas (Nicoletti 2010). Infected herds are quarantined, infected animals removed and animals are deemed brucellosis-free only after two negative tests at least 3 months apart (Animal Diseases Act, Act 35 or 1984). However, in resource-limited settings, slaughter of positive reactors is often not possible because of financial limitations (Moriyón et al. 2004). The World Organisation for Animal Health (OIE) advises vaccinating 5-8 × 1010 organisms ('high' dose) of S19 to heifers between 3 and 8 months of age (OIE 2016). S19 is effective at inducing an immunological response but, unlike RB51, this response interferes with the serological screening of natural infections (Schuurman 1983). S19 has an O-chain lipopolysaccharide, unlike RB51, that results in antibody persistence (Schurig, Sriranganathan & Corbel 2002). Little is known about the duration of the antibody response to S19 using the government recommended dose of 5 × 1010 organisms between 4 and 8 months in heifers and its interference in serological diagnostics in the longer term in a southern African field setting. A reduced dose of 3 ×108 to 5 × 109 organisms ('low' dose) can be given by subcutaneous or conjunctival route to decrease the antibody response (Nicoletti 1984; OIE 2016). The administration via the conjunctival route is more difficult, especially in a setting without efficient animal handling facilities. The only similar study in an African setting using a reduced dose of 3 × 109 organisms found that in 92 adult communal cattle the RBT-positive results decreased from 48% at 1 month after vaccination to 2.2% at 9 months and disappeared within 1 year (Schuurman 1983). In Brazil, the same dose was given to adult animals and by 9 months the RBT positives dropped to 0% from 100% at 1 month and indirect enzyme-linked immunosorbent assay (iELISA) to 4% from 100% at 1 month (Poester et al. 2000). In Argentina, a higher but still reduced vaccination dose of 3 × 1010 organisms in dairy heifers resulted in 100% buffered plate agglutination test (BPA) positive and 95% iELISA positive at 3 weeks, but 10% BPA positive and 0% iELISA positive at 50 weeks (Aguirre et al. 2002). Other studies have documented antibody and cell-mediated responses to vaccination (Dorneles et al. 2015b; Nielsen & Duncan 1988; Saegerman et al. 1999; Stevens, Olsen & Cheville 1995), but it is difficult to use these studies to make inferences about using serological tests for disease control after vaccination in a communal farming setting as they looked at different indicators of the immune response. These studies also used different colony-forming units (CFUs), vaccination dosages, ages of animals, breeds and settings. 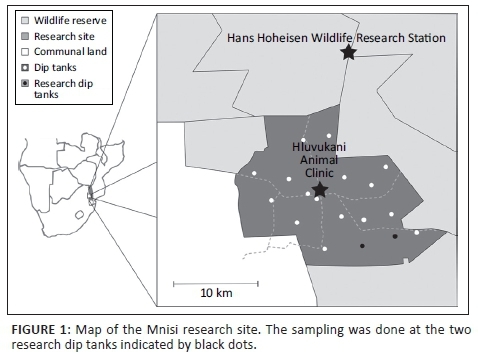 The objective of this study was to follow the serological response to the Brucella abortus S19 vaccine ('high' dose) in cattle in a rural community bordered by wildlife protected areas using the current government vaccination protocol. We describe the proportion of cattle that seroconverted and the persistence of antibodies in the blood. These results will provide valuable information for understanding brucellosis screening in similar settings in Africa where 'high' dose S19 vaccine is used. This was a longitudinal cohort study following the routine government control programme. Heifers (n = 58) with estimated age range between 3 and 12 months (median: 5 months) were vaccinated subcutaneously with 5 mL of Brucella abortus S19 vaccine (Onderstepoort Biological Products [OBP], Pretoria, South Africa). This vaccine has approximately 5 × 1010 organisms per dose of 5 mL (R. Macdonald [OBP] pers. comm., 15th September 2014). Twenty-nine unvaccinated males of 3-12 months (median: 6 months) in the same herds as the females served as controls. Eight per cent of cases were estimated to be younger than 4 months and 8% were estimated to be older than 4 months. RBT data were analysed in a mixed logistic regression using time and time2 as continuous explanatory variables (StatCorp 2009). Individual animals were taken as random effects to account for repeated samplings of the same animals. iELISA data were analysed in a similar model, except for the explanatory variable. Here, a categorical variable was used: 2 months after vaccination (1-3 months) and 1 year after vaccination (10-14 months). 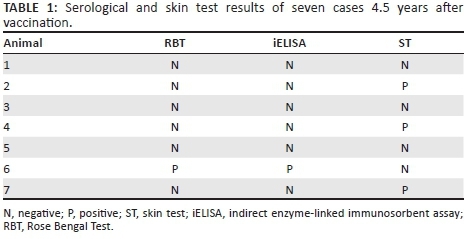 The agreement between RBT and iELISA was evaluated using Cohen's kappa test. All cases and controls were RBT negative at the beginning of the study on the day of vaccination. One sample of a control animal was RBT positive during the study, but iELISA negative. There were no other control RBT- or iELISA-positive samples. All the control animal study results, when corrected for sensitivity and specificity, were found to be 0% (95% confidence interval [CI]: 0.0-10.4) (Thrusfield 1995). The proportion of RBT-positive results decreased rapidly after 8 weeks. This decrease changed after 14 weeks to create an inverse logistic curve that reached a plateau after 43 weeks (Figure 3). This trend is linked to the significant quadratic term of time (time2). According to the model, the median seroconversion sample date from RBT positive to negative (proportion of heifers that had turned negative) was 24 weeks after vaccination, whereas 5% of the heifers remained RBT seropositive a year after vaccination. 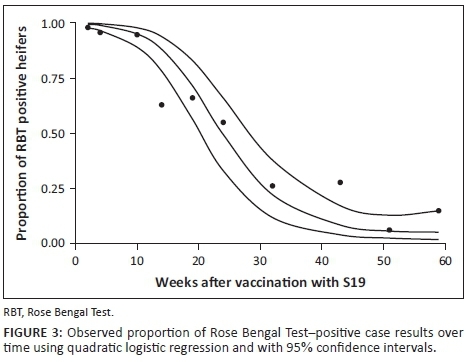 The proportion of iELISA-positive cases dropped from 99% (95% CI: 95% - 99.8%) 4-14 weeks post immunisation to 17% (95% CI: 7% - 39%) 43-59 weeks after vaccination (Figure 4). The response declines more sharply with RBT compared with iELISA (5% RBT-positive and 17% iELISA-positive cases between 10 and 14 months). The RBT is known to mainly detect immunoglobulins M (IgM) and immunoglobulins G (IgG), whereas the iELISA detects solely IgG (Nielsen et al. 2005). Hence, earlier RBT positivity and decline are expected as the IgM response to vaccination is earlier than the IgG response and does not last as long as the IgG (Godfroid et al. 2010). The apparent discrepancy between observed and fitted data in Figure 4 and, to some extent, Figure 3 is because of the random effect (animal) included in the mixed model. There is a substantial agreement between the RBT and iELISA results as shown with a kappa coefficient of 0.63, which indicates that the tests follow a similar pattern over time. The increase in positives from 51 to 59 weeks is because of cases that were not tested in week 51 and were tested in week 59 and found to be positive (1 RBT positive and 4 iELISA positive). 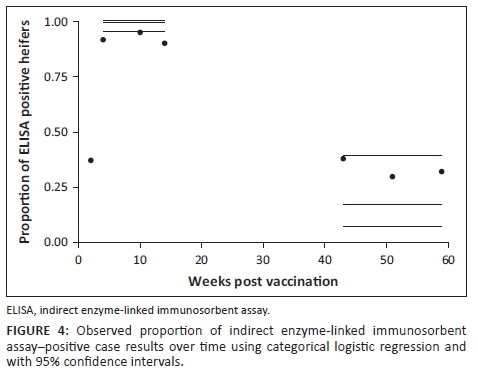 This comprehensive response to the vaccine, in a setting similar to other African countries, demonstrates the ability of the vaccine to induce a robust immunological response, which can then be used to assess vaccine coverage assuming an absence of a wild-type pathogen. A concern during the study was that the animals would be subjected to natural infection. Vaccinated heifers that are infected by wild-type B. abortus will show a classical 'boost effect', which is the hallmark of a secondary immune response (Fensterbank & Plommet 1979). This was not seen in our study. As there was only one RBT-positive sample in the controls and no iELISA-positive controls over the 59-week follow-up, natural infection is unlikely to have interfered with the antibody responses in the cases. The fact that non-vaccinated bulls remained negative also strongly suggests that there was no circulation of wild-type B. abortus in this setting throughout the duration of the study. A companion study at the same time by the authors documents that there was indeed no natural infection (Simpson et al. 2017). A 'boost effect' seen during disease surveillance should always be thoroughly investigated by veterinary services. This study used a high vaccine dose of 5 × 1010 organisms that is in line with the recommendations of the OIE (5-8 × 1010 organisms) (OIE 2016). It revealed a longer and more comprehensive antibody response than a similar study in Zambia that used a reduced dose of S19 (3 × 109Brucella bacteria) and in which no young animals (8-18 months at vaccination) tested RBT positive at 6 months after vaccination (Schuurman 1983). This reduced dose will result in less interference with diagnostics, and has been shown to induce the same level of protection as high doses both experimentally (Fensterbank & Plommet 1979; Plommet Fensterbank & Souriau 1976) and in the field (Nicoletti, Jones & Berman 1978). Ageing of the animals may have been inaccurate because only visual indicators, such as size, condition, teeth present and questioning the owner, were used. Combined with this inaccurate ageing is the variation of genetics, feeding and husbandry amongst the herds in the communal farming setting that results in animals growing at different rates. 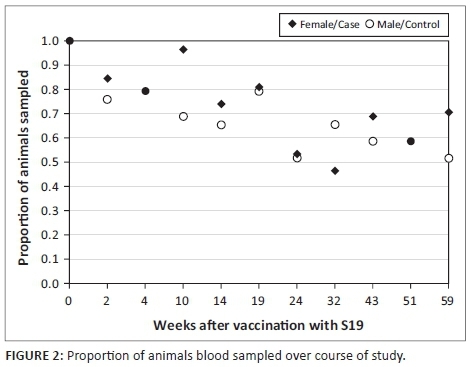 These variations may result in heifers' age being underestimated and the heifers being vaccinated outside the 4 to the 8-month window, which in turn may be responsible for a prolonging of the serological and allergenic positive responses, as the older an animal is at vaccination the longer the ST reaction persists (Saegerman et al. 1999). The constant decrease in serological titres in vaccinated heifers over time, combined with the absence of seroconversion in non-vaccinated bulls and with the absence of clinical signs suggestive of brucellosis (i.e. high rate of abortion), allows us to suggest the absence of brucellosis in the presence of positive serological reactions induced exclusively by S19 vaccination ('high' dose). It may be advised to use a 'low dose' vaccination that could result in less antibody persistence.